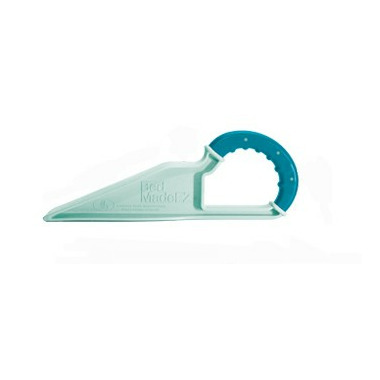 The Bed MadeEZ mattress lifter is a safety tool that inserts easily between mattress and box spring to raise the mattress so linens are easier to put on. Tucks in bedding easily. Save your back while making the bed. No more struggling to change bedding. Ergonomically designed. Perfect for young and old alike. I bought one and it works great. I have a tempurpedic mattress on top of a box spring. I put it between the box spring at a slight angle pointing towards the corner I want to lift. Some people buy 2 so they can lift one whole end of the bed at a time, which would be more efficient, but try it out with one first to see if you like it. Note that if your bed is lengthwise against a wall, it won't help you for the corner(s) of the bed that are up against the corners of the wall, unless you have an easy way to pull your bed out (e.g., wheels). Works like it is described. Helps to lift heavy mattress to tuck in sheets. I was a bit skeptical about purchasing this "gadget" but it really works! I suffer from a frozen shoulder and having to lift a thick, heavy mattress to tuck in my bedding was a nightmare! I highly recommend the product to anyone who has arthritis or back trouble.